Digital data are the building blocks of innovative services in a smart city. Especially Open Data from the public authorities. Some important data can already be freely consulted and reused in the Brussels-Capital Region. With Open Data, the requirement for transparency in the public authorities in digital terms is fulfilled. By opening up their data, the authorities enable the development of new services beyond their confines. exploit them commercially, for example by combining them with other data or including them in a product or an application. This Open Data licence has been drawn up by the BRIC, the Brussels Regional Informatics Centre, with the collaboration of Brussels Mobility which also provides open data. Among other things, data on events and work impacting on traffic in the Brussels Region are available in open format. 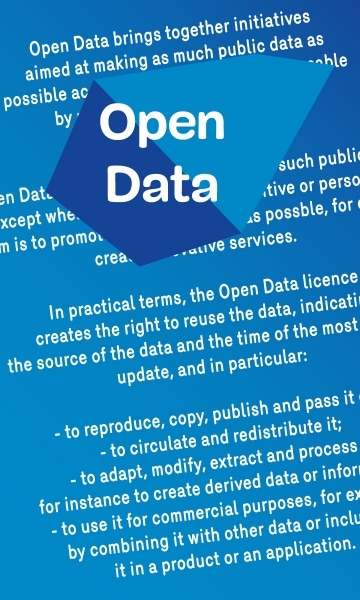 The regional Open Data licence has set the process in motion for the entire Brussels Region. Its provisions can be adapted for all data that the Brussels public authorities wish to open up to the general public. Moreover, the Brussels-Capital Region is not alone in working in this field. At local level, for instance, a series of data from the City of Brussels is also open for general use.